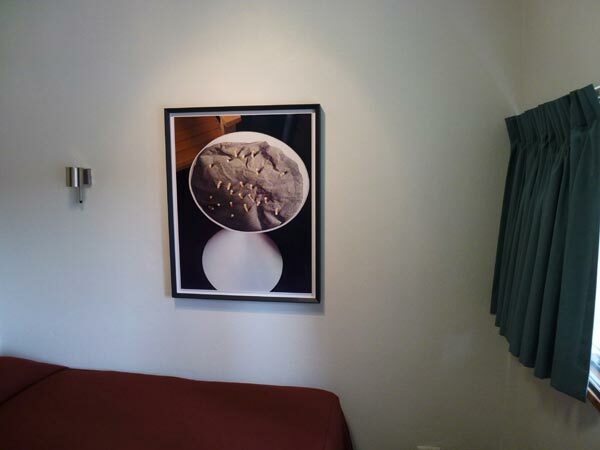 Graeme Smith: Thomas Demand, The Dailies, with contributions by Louis Begley and Miuccia Prada, Kaldor Public Art Projects, Commercial Travellers’ Association (CTA), MLC Centre, Martin Place, Sydney, March 23-April 22. Published RealTime 109, June 2012. Photography (in this post) Graeme Smith. When Sydney people walk into an unfamiliar room the first thing they do is head for the window. Everything—including the art on the walls—is sized up only after a quick assessment of the quality of the view. Sydney is a view city—even beyond white yachts bobbing on a sparkling harbour. The ‘Rear Window’ effect of looking into the rooms of others, the lovely mute blankness of windowless brick, a neighbour’s frangipani or the shiny seduction of a retail strip all make good views, as they would in other cities, but in Sydney it’s more important. The view reigns. Sydney seems to look outwards; looking inwards is inappropriate behaviour. Disturbing. As is randomly opening the door to a hotel room you haven’t booked. 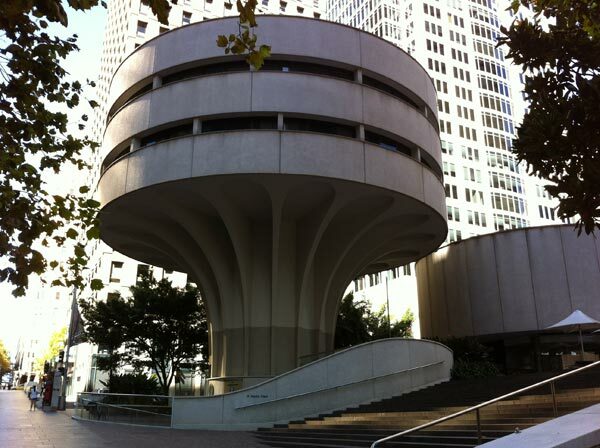 The Commercial Travellers’ Association houses a little-known, little hotel—a mid-70s Harry Seidler designed concrete mushroom in the centre of Sydney’s financial district. On one of the above ground floors, 16 little bedrooms look out radially onto the high-end retail and grand bank facades of Castlereagh Street and Martin Place. This was the setting for German artist Thomas Demand’s, The Dailies, and where a polite attendant in black invited me to start anywhere—so I opened the door to room 413 and went to the window. Prada, in an Art Deco building, Martin Place. 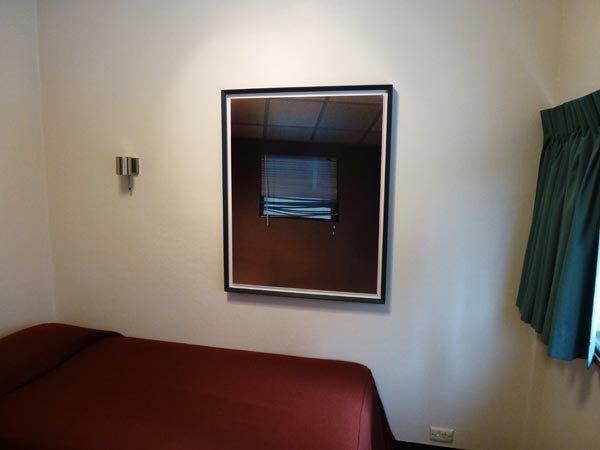 A photograph of a window in a brown wall. The window has a cheap-looking venetian blind covering it. The lower third of the slats is dishevelled—a word normally used for hair or clothing that also works for mussed up venetians. The ceiling is standard office-commercial. Cheap. Utilitarian. All of the above is meticulously constructed from paper, photographed, then beautifully and expensively printed using an almost obsolete process called dye transfer, by Thomas Demand. The result is a slickly real image that doesn’t quite add up. MAKES HIM THINK OF A HOSPITAL. HE TELLS THAT TO LENI. how on every floor the corridor circles the building. 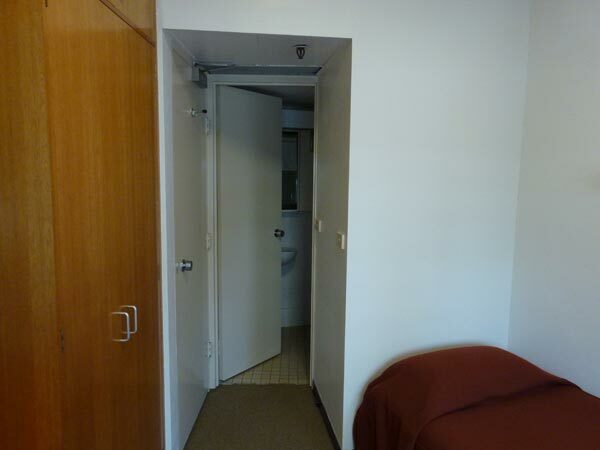 On some floors there are only double rooms. A fragrance designed or specified (not sure) by Miuccia Prada. Turn the handle and push against one of the tightly sprung doors; so tightly sprung that it feels locked, until the attendant in black tells you to push a bit harder. A touch of guilt about randomly barging into a hotel room that isn’t yours, then a hint of relief in discovering that no one is there. The lunchtime city outside is soundless through the double glazing. The only sound in the room is the humming of the air conditioner through the grate in the bulkhead, sounding for a moment like a shower running in the room next door. Look at the photograph on the wall above the bed. Read the text on the dresser. Look out the window. Step back (not far in this tiny room) and frame all three—the picture, the dresser with the text, the window—in your field of vision. Turn back to the door. Turn the handle, open, realise it’s the door for the bathroom, and a slight sense of disorientation sets in. Few of us miss this point, that regardless of where you are in the world, these mean little hotel rooms, apart from all looking the same, have one other thing in common: they’re non-places. Places between other places. In The Dailies, Demand’s photographs pick up on this and push the fourth floor into another level of disengagement. Demand has described his subjects as simply places you pass by, things that are formally interesting (no more than that), revisited memories fixed in photography or the nuclei of narratives. The refreshingly non-interpretive John Kaldor calls them little observations in the city, and this is essentially what they are. But it’s the effect of moving through the gaps, being in-between these little stories, that draws you in to another, less worldly place. A description I once heard used for the loaded emptinesses of Berlin comes to mind and seems to fit the feeling perfectly: ghostly present absences; and picking up on the theme I did find myself doing this door-to-door visitation a bit like a commercial travelling wraith. Cut off, removed, silenced, disconnected—but at the same time hoping that the group of jabbering school kids I saw earlier had finally pissed off and left me to wander alone—to be trapped in the gaps between someone else’s story, each door opening to reveal just a sampling of what wasn’t there. Begley was delightful. His words played with me—and the building, and Sydney, and Australia, and readers, and Kafka, and airports, and commercial travellers and lousy little hotel rooms. Regretfully, Prada’s fragrances didn’t do a thing—but only because of the limiting effects of asthma and a cold. On the other hand, Thomas Demand seemed to be provoking a type of reflection, and presumably insight, that only comes about through displacement. Demand gives, prescribing the vision, as he says, and Demand takes, handing you the moment and at the same time cutting it away. The subject in the photograph is a construction. It has an aura of reality but at the same time it doesn’t add up. It’s the slightly disturbing, preternatural silence of the spaces that exist either side of these disconnected moments that I find overwhelmingly seductive.